Today I’m going to show you how to compile and install OpenCV 4 on your Raspberry Pi. OpenCV 4 was officially released on November 20th, 2018. This blog post was updated subsequently on November 28th to accommodate the changes to the install (previously these instructions linked to the alpha release source code). It is also possible to pip install OpenCV as well! As of this update however, PyPi does not contain precompiled OpenCV 4 binaries which can be installed via pip. Therefore, if you want OpenCV 4 then you’ll need to compile from source. To learn how to install OpenCV 4 on your Raspberry Pi, just follow this tutorial! 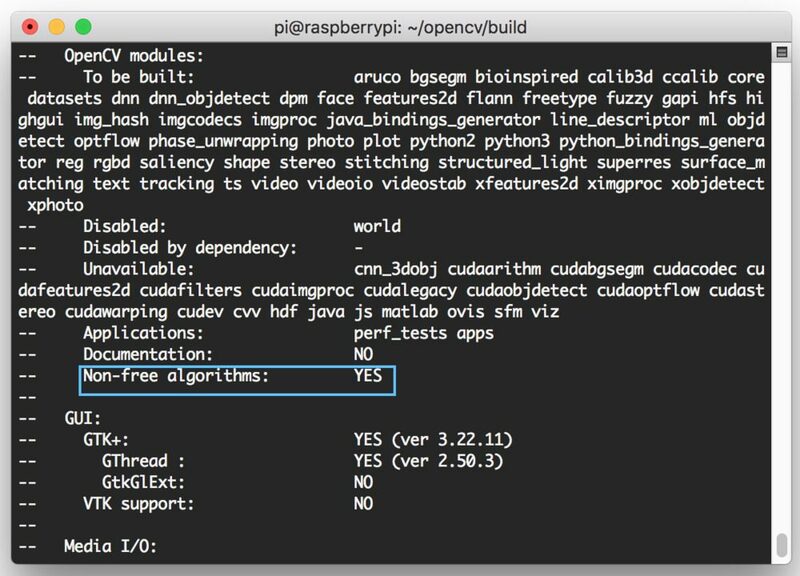 In this blog post, we’re going to install OpenCV 4 on your Raspberry Pi. OpenCV 4 has a goal of reducing bloat, adding optimizations, and updating the deep learning module. Note: There are many install guides on my blog. Before you begin, be sure to check out the available install tutorials on my OpenCV installation guides page. First we’ll cover assumptions that go along with this tutorial. 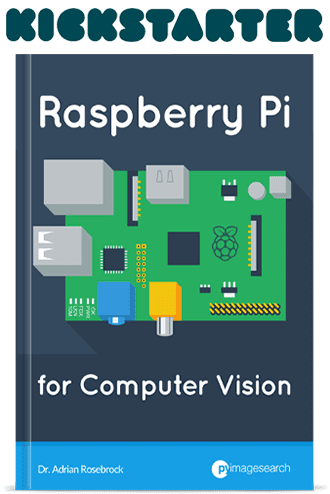 From there, we’ll walk through 7 steps to compile and install OpenCV 4 on your Raspberry Pi. Compiling from source allows us to have full control over the compile and build. It also allows us to grab the latest code — something that pip and apt-get don’t offer. Finally, we’ll test our OpenCV 4 install on our Raspberry Pi with a fun project. In this tutorial, I am going to assume that you already own a Raspberry Pi 3 B or the newer Raspberry Pi 3 B+ with Raspbian Stretch installed. To upgrade your Raspberry Pi 3 to Raspbian Stretch, you may download it here and follow these upgrade instructions (or these for the NOOBS route which is recommended for beginners). The former instructions take approximately 10 minutes to download via a torrent client and about 10 minutes to flash the SD card with Etcher or another tool. At that point you can power up and proceed to the next section. After you’ve changed the setting and rebooted, you can test SSH directly on the Pi with the localhost address. Open a terminal and type ssh pi@127.0.0.1 to see if it is working. To SSH from another computer you’ll need the Pi’s IP address — you could figure it out by looking at your router’s clients page or by running ifconfig on the Pi itself. Keyboard layout giving you problems? Change your keyboard layout by going to the Raspberry Pi desktop preferences menu. I use the standard US Keyboard layout, but you’ll want to select the one appropriate for you. To get the OpenCV 4 party started, fire up your Raspberry Pi and open an SSH connection (alternatively use the Raspbian desktop with a keyboard + mouse and launch a terminal). 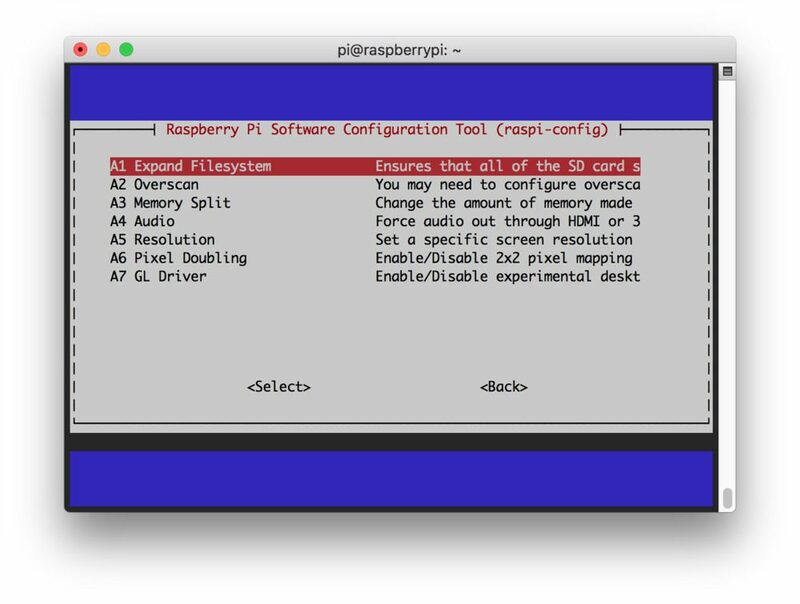 Figure 1: Selecting the “Advanced Options” from the raspi-config menu to expand the Raspbian file system on your Raspberry Pi is important before installing OpenCV 4. Next we’ll actually expand the filesystem. Figure 2: The Raspberry Pi “Expand Filesystem” menu allows us to take advantage of our entire flash memory card. This will give us space necessary to install OpenCV 4 and other packages. The asterisk will grab the ARM specific GTK. Once you have all of these prerequisites installed you can move on to the next step. Our next step is to download OpenCV. Let’s navigate to our home folder and download both opencv and opencv_contrib. The contrib repo contains extra modules and functions which we frequently use here on the PyImageSearch blog. You should be installing the OpenCV library with the additional contrib modules as well. If you skip renaming the directories, don’t forget to update the CMake paths. Now that opencv and opencv_contrib are downloaded and ready to go, let’s set up our environment. Let’s grab and install pip, a Python Package Manager. If you aren’t familiar with virtual environments, please take a moment look at this article on RealPython or read the first half of the this blog post on PyImageSearch. Virtual environments will allow you to run different versions of Python software in isolation on your system. Today we’ll be setting up just one environment, but you could easily have an environment for each project. To finish the install of these tools, we need to update our ~/.profile file (similar to .bashrc or .bash_profile ). This line simply creates a Python 3 virtual environment named cv . Figure 3: The workon command is part of the virtualenvwrapper package and allows us to easily activate virtual environments. Here I’m activating the cv environment which we’ll install OpenCV 4 into on our Raspberry Pi. We can now prepare OpenCV 4 for compilation on our Raspberry Pi. For this step, we’re going to setup our compile with CMake followed by running make to actually compile OpenCV. This is the most time-consuming step of today’s blog post. $ cmake -D CMAKE_BUILD_TYPE=RELEASE \ -D CMAKE_INSTALL_PREFIX=/usr/local \ -D OPENCV_EXTRA_MODULES_PATH=~/opencv_contrib/modules \ -D ENABLE_NEON=ON \ -D ENABLE_VFPV3=ON \ -D BUILD_TESTS=OFF \ -D OPENCV_ENABLE_NONFREE=ON \ -D INSTALL_PYTHON_EXAMPLES=OFF \ -D BUILD_EXAMPLES=OFF ..
Update 2018-11-27: Notice the -D OPENCV_ENABLE_NONFREE=ON flag. Setting this flag with OpenCV 4 ensures that you’ll have access to SIFT/SURF and other patented algorithms. Be sure to update the above command to use the correct OPENCV_EXTRA_MODULES_PATH path. If you’re following along with this tutorial exactly you should not need to update the path. Figure 4: Ensure that “Non-free algorithms” is set to “YES”. This will allow you to use patented algorithms such as SIFT/SURF for educational purposes. 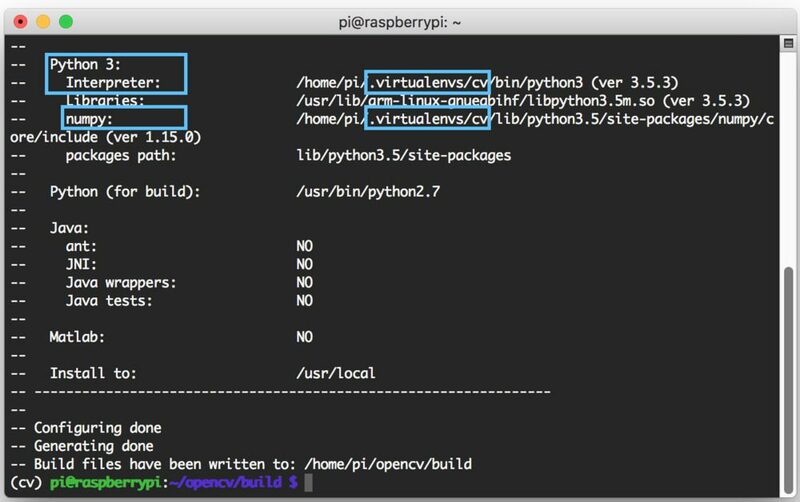 Figure 5: The CMake command allows us to generate build files for compiling OpenCV 4 on the Raspberry Pi. Since we’re using virtual environments, you should inspect the output to make sure that the compile will use the proper interpreter and NumPy. Take a second now to ensure that the Interpreter points to the correct Python 3 binary. Also check that numpy points to our NumPy package which is installed inside the virtual environment. Before you begin the compile I would suggest increasing your swap space. This will enable you to compile OpenCV with all four cores of the Raspberry Pi without the compile hanging due to memory exhausting. Notice that I’m increasing the swap from 100MB to 2048MB. If you do not perform this step it’s very likely that your Pi will hang. Note: Increasing swap size is a great way to burn out your Raspberry Pi microSD card. Flash-based storage have limited number of writes you can perform until the card is essentially unable to hold the 1’s and 0’s anymore. We’ll only be enabling large swap for a short period of time, so it’s not a big deal. Regardless, be sure to backup your .img file after installing OpenCV + Python just in case your card dies unexpectedly early. You can read more about large swap sizes corrupting memory cards on this page. Note: In the make command above, the -j4 argument specifies that I have 4 cores for compilation. If you have compile errors or your Raspberry Pi hangs/freezes you can try without the -j4 switch which can eliminate race conditions. Figure 6: I’ve compiled OpenCV 4 on my Raspberry Pi successfully (the make command has reached 100%). So now I’ll issue the sudo make install command. I cannot stress this step enough — this step is critical. If you don’t create a symbolic link, you won’t be able to import OpenCV in your scripts. Also, ensure that the paths and filenames in the above commands are correct for your Raspberry Pi. I suggest tab-completion. Let’s do a quick sanity test to see if OpenCV 4 is ready to go. The first command activates our virtual environment. Then we run the Python interpreter associated with the environment. If you see that you have version 4.0.0 installed, then you’re now fully armed and dangerous + ready to perform computer vision and image processing. A while back, I was working hard on responding to PyImageSearch readers via comments, emails, and Twitter/Facebook/LinkedIn. I make a point of responding to as many incoming questions and comments as I can. It was 4:30 in the afternoon and I was cranking away at the keyboard in a “flow” state. But while I was typing away, something triggered in my brain that I was thirsty. Very thirsty. So I took a quick break from the keyboard and went to the fridge to grab a tasty beer ?. All my beers were gone! I grabbed some water instead and went back to the computer. I closed all correspondence windows and fired up a code editor/IDE (I like PyCharm). I started tapping away at the keyboard again and sipping some water. I was building a security cam with my Raspberry Pi which will catch people leaving/entering my apartment and opening/closing my fridge. I’ll catch that SOB stealing my beer next time! Figure 7: Examples of the Raspberry Pi home surveillance system detecting motion in video frames and uploading them to my personal Dropbox account. If you want to learn how to build a security camera with your Raspberry Pi and OpenCV 4, then I suggest you read the original blog post. Detects motion via background subtraction. Uploads images of intruders and other motion to Dropbox so you can review events later. All images are timestamped so you’ll know when someone was in view of your Raspberry Pi security camera. Or if you’re savvy and want to grab the code right now, you can be up and running in a few moments after you paste your Dropbox API key in the config file. To download this project, scroll to the “Downloads” section of this blog post and fill out the form. $ workon cv $ pip install dropbox $ pip install imutils $ pip install "picamera[array]"
Figure 8: The Raspberry Pi security camera configuration file. An API key must be pasted in, and a base path must be configured. For headless mode, “show_video” should be set to “false”. At this point it is important to edit the configuration file with your API key and Path. To find your API key, you can create an app on the app creation page. Once you have an app created, the API key may be generated under the OAuth section of the app’s page on the App Console (simply click the “Generate” button and copy/paste the key into the configuration file). The Path needs to be a valid path in your Dropbox file structure. Note: Don’t share your API key with anyone unless you trust them! For testing, you can leave "show_video": true and connect an HDMI screen + keyboard/mouse to your Pi. Eventually you’ll want to set the value to false and have your Pi run headless with few cables connected to it so you can hide it in the inconspicuously. Once you get your project working, you can monitor the Dropbox folder in your web browser (you might need to refresh to check for images), or if you are syncing the folder to your laptop/desktop, you can monitor the folder there. I highly recommend that you read the entire blog post as well. Happy hacking with your Raspberry Pi and OpenCV 4! 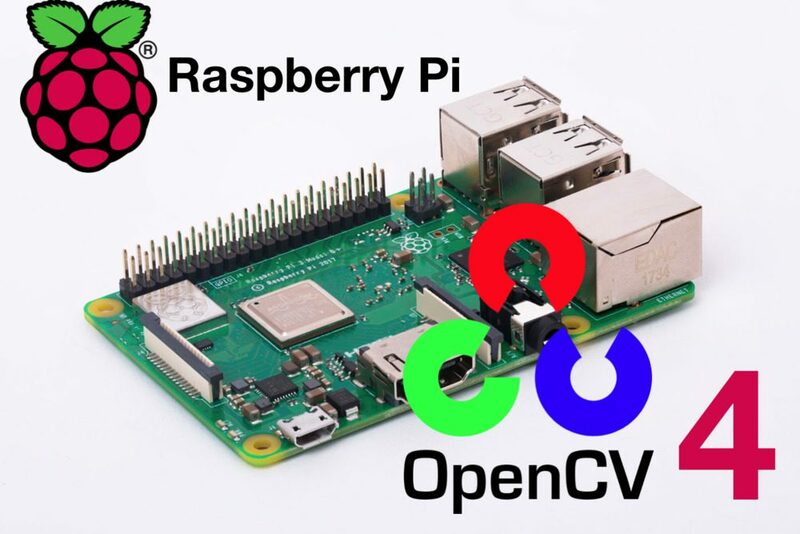 Did you encounter an error installing OpenCV 4 on your Raspberry Pi? Don’t throw the little gadget across the room yet. The first time you install OpenCV on your Raspberry Pi, it can be very frustrating and the last thing I want for you to do is to end the learning process here. 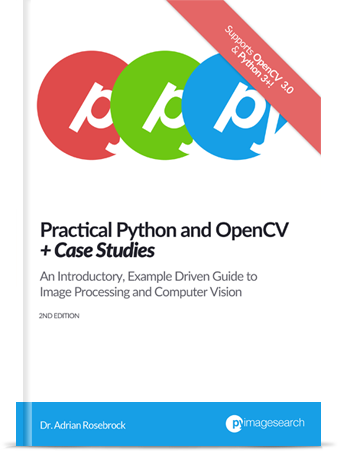 If you really get stuck, don’t forget that the QuickStart Bundle of Practical Python and OpenCV + Case Studies comes with Raspberry Pi images which are pre-configured and ready to go. Images for RPi 3B/3B+ and RPi Zero W are included. These images can save you hours and days (yes it took me about 6 days to set up the RPi Zero W) of frustration. If you have your heart set on figuring this out on your own, I’ve put together a short list of frequently asked questions (FAQs) and I suggest that you familiarize yourself with them. Q. How do I flash an operating system on to my Raspberry Pi memory card? Grab a 16GB or 32GB memory card. Flash Raspbian Stretch with Etcher to the card. Etcher is supported by all 3 major OSes. Insert the card into your Raspberry Pi and begin with “Assumptions” and “Step 1” in this blog post. Q. Can I use Python 2.7? Q. Can I just pip to install OpenCV 4? A. In the future, yes. Currently you’ll need to compile from source until piwheels has an OpenCV 4 binary available. Q. Why can’t I just apt-get install OpenCV? A. Avoid this “solution” at all costs even though it might work. First, this method likely won’t install OpenCV 4 for a while. Secondly, apt-get doesn’t play nice with virtual environments and you won’t have control over your compile and build. Q. The mkvirtualenv and workon commands yield a “command not found error”. I’m not sure what to do next. First, ensure you have installed virtualenv and virtualenvwrapper properly using the pip package manager. Verify by running pip freeze , and ensure that you see both virtualenv and virtualenvwrapper in the list of installed packages. Your ~/.profile file may have mistakes. View the contents of your ~/.profile file to see the proper export and source commands are present (check Step #4 for the commands that should be appended to ~/.profile ). You might have forgotten to source your ~/.profile . Make sure you run source ~/.profile after editing it to ensure you have access to the mkvirtualenv and workon commands. Q. When I open a new terminal, logout, or reboot my Raspberry Pi, I cannot execute the mkvirtualenv or workon commands. A. If you’re on the Raspbian desktop, this will likely occur. The default profile that is loaded when you launch a terminal, for some reason, doesn’t source the ~/.profile file. Please refer to #2 from the previous question. Over SSH, you probably won’t run into this. Ensure your cv virtual environment is active by using the workon cv command. If this command gives you an error, then verify that virtualenv and virtualenvwrapper are properly installed. Try investigating the contents of the site-packages directory in your cv virtual environment. You can find the site-packages directory in ~/.virtualenvs/cv/lib/python3.5/site-packages/ depending on your Python version. Make sure (1) there is a cv2 sym-link directory in the site-packages directory and (2) it’s properly sym-linked. Be sure to check the site-packages (and even dist-packages ) directory for the system install of Python located in /usr/local/python/ , respectively. Ideally, you should have a cv2 directory there. As a last resort, check in your build/lib directory of your OpenCV build. There should be a cv2 directory there (if both cmake and make executed without error). If the cv2 directory is present, manually copy it into /usr/local/python and then link the .so file to the site-packages directory for the cv virtual environment. Q: Why do I encounter a message about “Non-free modules” not being installed? How can I get the OpenCV non-free modules? A: New in OpenCV 4, a special CMake flag must be set to obtain the non-free modules. Refer to Step #5 above and pay attention to the flag in the CMake command. Q. What if my question isn’t listed here? A. Please leave a comment below or send me an email. If you post a comment below, just be aware that code doesn’t format well in the comment form and I may have to respond to you via email instead. Today we installed OpenCV 4 on our Raspberry Pi. Compiling from source was paramount so that we could obtain OpenCV 4 since it isn’t possible yet to install OpenCV 4 via pip. We then tested our install and deployed a Raspberry Pi as a security camera. This security camera will detect motion via background subtraction and upload pictures of intruders to Dropbox. You can read the full Raspberry Pi + home surveillance post here. To stay up to date with PyImageSearch, be sure to drop your email in the form below! Hi Sudeep, good catch. It is very important to change the SWAP to 1024 before starting the compile. I made this change for Adrian while he is on vacation. Hello Adrian, I followed step by step your beautiful post and everything went smoothly up to the Cmake -D where in the end I received an error, thinking it was not very important I continued the installation but when I typed Make -j4 not the He found … where did I go wrong? make: *** No specified target and no makefiles found. Stop." Hi Marco, this is because you did not rename your directories as specified in Step #3. It isn’t your fault — due to OpenCV 4 Alpha releasing on September 20th while Adrian was on vacation, and considering Adrian wrote this post about 3 weeks ago, this post needed a last minute update (from cloning the Git repo to downloading the zip archives). I updated the post to show the need for renaming the directories. Simply rename your opencv-4.0.0-alpha directory to opencv and opencv_contrib-4.0.0-alpha to opencv_contrib. Then delete the build directory and re-run CMake and continue to follow the instructions. Sorry for the mixup and thanks for bringing it to our attention! Hi 🙂 I got the same error, though I renamed correctly all folders. Seems to be an error from the previous step, using cmake. Cmake does not say “Configuring done” and “Generating done”, but it throws an error log file and I cannot figure out why. Any suggestion? PS. I followed the tutorial step by step, even if I am very familiar with Linux and bash. I’m running the latest version of Raspbian Lite, if that can help. 1. Step #1 should NOT be necessary, as Raspbian will do this step *automatically* on the first boot and reboot afterwards, which is since a long time BTW. Even though it might not yield any errors doing it a second time, I see no improvement in it, whatsoever. 2. Even though recommended by the foundation itself, in the German Raspberry Pi forum we have commonly reports of strange issues caused by NOOBS installs of Raspbian which DO NOT OCCUR when doing a direct flashing of Raspbian onto the SD card, with the same Pi, PSU etc. It’s not entirely clear what causes this, but IMO NOOBS is to be recommended with caution, especially to completely new users. They should be able to use Raspbian installed directly as it’s the next step after NOOBS for most people anyway. Interesting on Raspbian automatically expanding the filesystem. I recently did an install and had to do it manually. Also, I think the only reason why Adrian recommends NOOBS for beginners is since it’s recommended by the foundation itself. But thanks for your input on it! 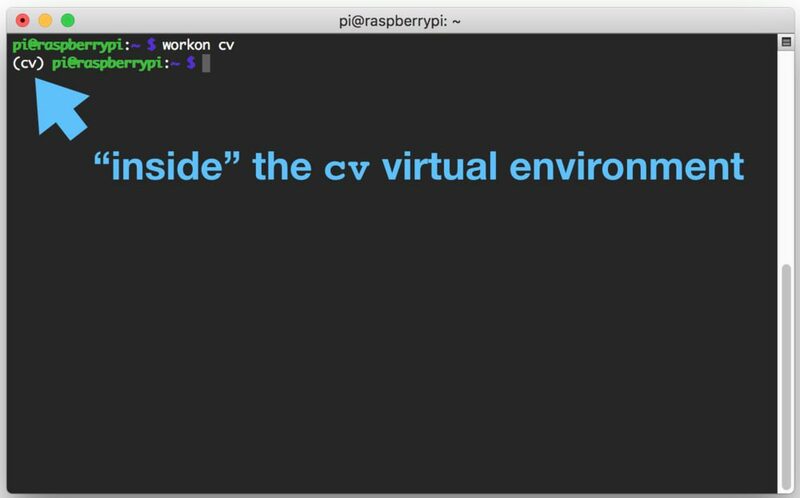 I think if you’re interested in learning about OpenCV and other articles by Adrian, then you’re probably more likely to be comfortable working on Raspbian rather than NOOBS! I have done embedded work on Arm processors (STM32F1 and F4) in C without operating system, but no Raspberry Pi. Please help me with information. I would like to use the unit as a type of trail camera, with animal recognition and discarding some photos but saving others according to type of animal. This means that the processor must mostly sleep, and be woken up by passive infrared detector. The question is: Will the Raspbian operating system be able to handle this wakeup to take photos in a short time, eg., milliseconds? I have seen Raspberry Pis boot up, and that is totally useless, minutes rather than milliseconds. w/r to RPi starting in minutes : consider a RPi as … a PC (libreoffice, wolfram are x86 ports to ARMs) and notice it boots about 10 100 times faster than Windows (part of Windows booting is hidden : there is a desktop for marketing “reasons”, but difficult to use). There is a thing RPi is very bad: it is what PC have, named ACPI (ask wikipedia). RPi has no -or very lousy and buggy- sleep options. Do not worry : nanoPi (chinese “clones”, with better HW design, octo cores – are worse in this domain,… I am af asking a raid you asking a feature where RPis are at their worst. b) one can remove the tiny swap partition and add an external swap file on a USB disk. Advantages : repeated writes on a flash device ruins it…. and swap is made to allow repeated writes. No need to remove libreoffice (suppose one needs it) or wolfram. One can get rid of the 100M nanoflash (eats a little disk swap). b) Interesting and theoretically speaking it makes sense. Definitely something worth a try. c) Advantages: optimizations, C++11 support, more compact modules, and many improvements to the Deep Neural Network (DNN) module. heat issues are not a worry for computers between Syria and North India: as people know one can reach 50C, one has an air conditioner. OTOH, in West Europe, heath spells are rare enough, thus most people do not have air conditioners. I have a nanoPi m3 (octocore) and just an airshield -no fan : is noisy- and tried with 8 cores (compiling xtensa-gcc : does not need swap extension: it lasted 15 minuts with heatsink before crushing: using 3 cores was OK). nanoPi m3 are very much like RPi (less support; use debian stable instead of debian unstable ; software compiled on a nanoPi is likely to work -ocv does- once newer (but compatible) libraries are installed. same RAM -1G-: worse temperature scaling, IMO). a) I made a huge (1G) file in ~/ext/catalogue/gros using dd. 623 ls # what did I do? You have not done anything wrong. Use the filename that you have found. I think it’s a path problem, but I do not know how to get it back, can you help me? Hey Matteo, I would recommend you read the “Troubleshooting and Frequently Asked Questions (FAQ)” section of this tutorial as I provide answers to the most common reasons why you may not be able to import the OPenCV bindings. I completed the installation. I had to interrupt make -j4 once when it was stuck at 99%. I ran make again without any parameters. I have followed the rest of the guide including creating the symbolic link. However, when I import cv2 python 3.5 is unable to find the file. I have created a virtual environment named cv4 and have followed the rest of your instructions without problems. What data should I share to help us diagnose the problem? Take a look at the “Troubleshooting and Frequently Asked Questions (FAQ)” section of this tutorial as I discuss the most common reasons why the import will fail. There are many reasons why that could happen. I have documented the most common reasons in the “Troubleshooting and Frequently Asked Questions (FAQ)” section of this post. hello Adrian, I would like to understand one thing, why on the Raspberry even if you follow the post to the letter then OpenCv does not install as it should, even repeating the installation several times then you always find yourself with the same problem! You know I thought maybe if you put a video with all the steps of the installation maybe it could help beginners like me to understand where have wrong or at least see where there are differences in the installation. I’ve done a few Raspberry Pi + OpenCV install guide videos. I’m considering doing one for this post as well but I wanted to wait until OpenCV 4 is officially released. hi , have anyone of you here faced this problem? the build of opencv hang/not responding when come to 98% progress. It sounds like your Pi is running into a threading/race condition which is causing the problem. at the end of the compilation using -j4 you run two linking processes – each taking 80% of the available memory and the raspberry pi swaps itself to death achieving nothing (run “top” in a terminal window, hit M to sort by memory and you’ll see two large compilation processes which do not get any significant cpu). I was able to successfully install OpenCV 4.4.0-alpha. However I had some initial issues. 1. The first attempt failed, RPI locked up. I had the swap space at 1024MB and used the make -j4 command. While running the RPI was very hot (80 – 85C). cmake fails to determine the bitness of the target platform. 2. I executed this with only cmake. I didn’t use -j4. 3. It took approximately 4 hours, but the build complied and installed successfully. Thanks for sharing Andrew! And congrats on getting OpenCV 4 installed on your Pi. Congrats on resolving the issue, Gaurav! same here . How did you do it? Did you increase your swap size like I recommended in the tutorial? Make sure you do so. Alternatively, you can pip install opencv. I followed all your steps until make -j4. It was stuck at 99% for a long time. Restarted make and now currently keeps stopping at 98% how many ever times I try. I have already increased the swap size to 2048MB. Please let me know if there is any other step i am missing. Try using only a single core for the compile via just “make” (no “-j4”). Step # 6 references incorrect lib? I see only ARM version, not x86. I had to do this instead. Hey Arul, I’ve updated the tutorial with the path most readers are getting. I suggest other readers use tab completion to derive the correct file name. Are you referring to the interpreter used for the compile? If so, ignore it — that’s a bug in the “cmake” output. As long as your “Python 3” section looks like mine you can proceed. Thank you for the reply, i redid the whole thing (actually got a larger sd because of space problems) and everything went fine. Thanks for the guide! configuration in complete, errors occured! Take a look at your output of “cmake”. It will tell you what the error is. Hi, thanks for the detailed tutorial. I faced an issue when creating the link in step #6, the output .so file had a different name “cv2.cpython-35m-arm-linux-gnueabihf.so” instead of “cv2.cpython-35m-x86_64-linux-gnu.so”, so I had to rename it (this was already pointed out in your previous tutorial for installing OpenCV 3). Thanks Francisco. I’ve updated the post but I would encourage readers to use tab completion to correctly determine their output filename. Thanks for sharing, Victor. I’ve updated the blog post. I also recommend readers perform tab completion so correctly determine the filename. Hi Dr. Adrian. As a beginner, I wonder if it’s possible to have both versions of OpenCV (3.x and 4.x) installed on a Pi. Can I use a virtual environment (VE) for each version? If so, how can I do that? Is it covered in any blog post? Besides, how can I update an Environment with a more recently Python version when one becomes available? Can I do the same with a new OpenCV release in a VE? Thank you. Thank you for the post really appreciate it. I built OpenCV 4.0 on new Pi3 Model B+ booting off mSATA drive with you can do with the new Model B+. I was monitoring the build with -J4 switch with free -h and the process actually used up the swap file and stalled in latter stages of the build, (99% stage). Increased the swap size and was able to make it through that late build stage and complete. Its possible that some of the others reading the comments hit the same situation. Quick question why does your version show 4.0 and mine show 4.0 alpha on the check version? Hey Steven, thanks for the tip on increasing swap size further. Compiling only only a single core just should resolve the issue as well. Regarding your question, it looks like you compiled OpenCV using the official alpha version of the library. When I compiled OpenCV it was with the pre-release which did not have the “alpha” tag, hence the discrepancy. b) last stage is a single process build (makes a huge *.so with a lot of libraries, ready to be called by python): it needs less than 1G swap (total less than 2G RAM+ virtual RAM : if RPi had 2 G RAM, … no swap would be needed. Hello! Is there a reason for installing inside the “cv” environment? I have seen guides that skip that step, and in the end you can call “import cv2” without a “workon cv” command beforehand. Using Python virtual environments is a best practice in Python development. They are certainly optional but heavily recommended. If you’re new to Python virtual environments or how they work be sure to read this post. I’m getting “zsh: no matches found: libcanberra-gtk*” when I try to apt-get libcanberra-gtk* . As far as I know, my sources are up to date. Do I need to add another apt source somewhere? Unfortunately it seems like you may need a larger swap file. while running a python file. Adrian, I have a problem, with the import cv2 as described in FAQ, but as I am a beginner, I dont really understand what to do? Could you please help? Hey Rion, unfortunately without physical access to your Pi it is hard to determine where you would have made a mistake. It’s okay if you are a beginner, but you need to take the time to educate yourself on how the command line argument works, including file paths. Again, it’s impossible for me to guess what step may have tripped you up without more information so I suggest you take it slow and work through the FAQ. Can the OpenCV 3 and 4 coexist in Raspberry pi ? Or do I have to remove one if want to install the other? And if not, how to configure and specify the one that I want when running one python script ? 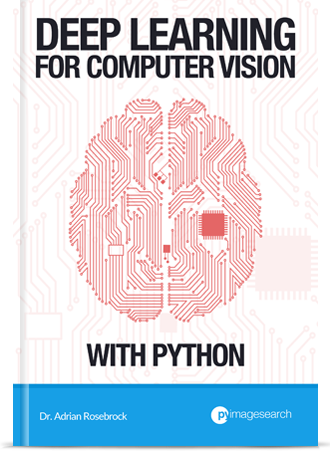 Both can coexist on the same machine, just create a separate Python virtual environment for your OpenCV 4 install. Other than that, no other changes are required. Hey Adrian, I made it most of the way through this tutorial…while compiling opencv, my Pi stops at [ 98% ] Built target opencv_perf_tracking. I expanded the swapfile size to 1024…there’s no error message, just no more progress. Should I close the terminal and start from the compiling step again? Should I make the swapfile bigger? Did you ever find out who stole your beer? Hi, Adrian, I posted a comment yesterday about my Pi not responding during the compile. I left it running overnight and when I came back to it, it had run out of memory. I increased the swapfile size to 2048 Mb, ran the compile again, and it works now. Thanks for your outstanding tutorials! Awesome, congratulations on getting OpenCV installed on your Pi! Hi adrian . i have been trying to install opencv from past 4 days. I have gone through all versions from 3.3.0 to the 4.0 . Currently in this tutorial the cmake compiled till 98% but has been like this since 1.5 hrs . This opencv thing has made be furious . Please suggest something x(. Have you tried (1) increasing your swap size and (2) compiling using just a single core? What about doing a pip install of opencv? Hi Adrian! I followed the steps and everything worked well on the virtual environment but, what if i want to use opencv 4 on python 3(IDLE)? there’s an easy way to do it without starting again with a different process? If you are using the same Python version for a different environment you can simply copy your cv2.so bindings into the new site-packages directory for the environment. Otherwise you will need to recompile OpenCV for that specific Python version number. You may also be able to pip install opencv. Hi Adrian, Thanks for your tutorial. But i got some problem when i’m on step 5, i can’t do “make” it says (cannot find makefile. stop), and also i can’t move into opencv directory, can you tell how to fix this? Your “cmake” directory likely excited with an error. Go back to the “cmake” step and investigate the output to find the error. Once “cmake” executes without error then you can run “make”. I installed opencv-4.0.0-beta last night; I noticed the beta version was available so I downloaded the source and compiled it instead of the alpha. Seems to have compiled successfully. Awesome, congrats on getting OpenCV 4 installed on your Pi, David! Love the tutorials. 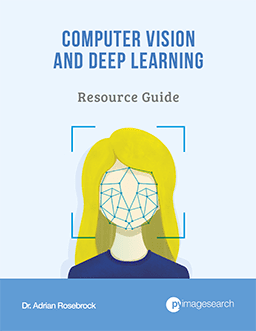 You are really the main resource for opencv on raspberry pi. I’m hoping you can help me with a problem I have. I’ve gone through the tutorial 3 times now, and no matter what I do during step 5, I cannot get the interpreter, or numpy to point inside the virtual environment. What am I doing wrong? Hey Darcy, are you sure you are in the Python virtual environment when running “cmake”? Unfortunately without having physical access to your Pi I’m not sure what the issue may be. Don’t worry though, OpenCV 4 will soon be released and then you’ll be able to use pip in install opencv. It sounds like your Raspberry Pi is frozen. Delete the “build” directory, re-create it, re-run “cmake”, but this time run “make” without the “-j4” option. The compile will take longer but your Pi shouldn’t lock up. It sounds like you created a Python 2.7 virtual environment instead of a Python 3 virtual environment. Can you check your Python virtual environment version? Congrats on getting OpenCV 4 installed on your Pi, Austin! I seem to have a problem. Maybe I don’t need sudo. I think the ~/ takes me to home, so what is the file I’m editing, “.profile” is not valid. No, you do not need “sudo”. Use just “nano ~/.profile” so you are editing the .profile file of the “pi” user. Awesome tutorial. I am building a drone with an IR camera using openCV. But PLEASE for the love of all things holy. REMOVE the dollar signs ‘$’ from your shell lines. They are beyond annoying and serve no purpose. I still have no idea why people still do that. They do serve a purpose. 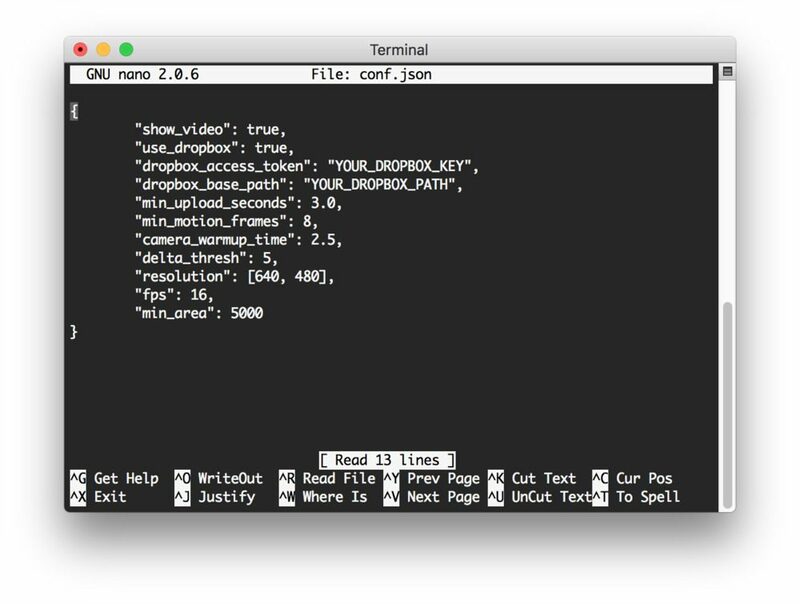 The “$” indicates that you are at the command line executing a command versus opened up a text file for editing, etc. hi, im stuck while in process make -j4 in the line 100% building CXX object module/python3/CMakeFiles/opencv_python3.dir/__/src2/cv2/cpp.o can you help me?? It sounds like your Raspberry Pi has hung. Stop the compile, delete your “build” directory, re-create it, and re-run “cmake” and “make”, but this time increase your swap size to 2048MB. i just had the same problem during the last two days. Please check the effect of changing the “CONF SWAPSIZE=2048” in the dphys-swapfile using the “free -m” command before and after stopping and restarting the process. I think my pi has stalled. I am at mostly 100% but the command prompt won’t come back. This is a B 3+ with swap file expanded to 2048 as specified. The compile was done with the -j4 switch. This is a BRAND NEW Pi and a brand new install. I got a bunch of warnings about clock skew and some about parameter passing being changed in GCC 7.1. After a lot of retries, I found that I was having some intermittant network issues. So I went bakc to a physical connection. I had some trouble figuring out why I could not switch to my cv environment locally. After editing my .bashrc file, I was up and recompiling. I would like to ask about the GCC 7.1 warnings. Will this be updated soon? GCC is now at 8.5? That should, ideally prevent the Pi from locking up. Clearly I am having issues. I keep missing steps. Forgetting to change to CV and so forth. I have removed the build directory several times now and finally have a new compilation running under CV directly and not limited by my sporadic network issues. I will let this run this morning and hope that I can come home to a new compile. I still worry about “failed” errors in the build cycle. Several items were marked this way. Do I need to post those are is it normal to see a few items marked this way? Seems fishy to me but I do not know any of details of this build. It’s totally normal to see the “failed” message in the “cmake” output. OpenCV has A LOT of different configurations. The “cmake” script is just checking for various configurations and reporting “failed” if it cannot find a given configuration — it’s nothing to worry about. First of all a pretty comprehensive and well compiled tutorial. OpenCv Intsalltion on my pi3 B+ has been a nightmare for me. First try it got hung up , Then i had to restore my pi from backup . The Second time i tried from some other method .This time it went thru’ successful but my cv2.so got listed under /home/pi and i could’t do the sym-link . I am now going to try it for the 3rd time from this link . Hopefully it works out fine . Any tips that could help me out . Both of those will help the Pi from locking up. As for your sym-link issue that just sounds like you were in the incorrect directory when creating the sym-link. Try again but this time make sure you’re in the “site-packages” directory. It sounds like you Pi has locked up. Try increasing your swap size to 2048MB and compiling with only a single core (i.e., “make -j1”). The compile will take longer but it should prevent the Pi from locking up. same with me..i will try make -j1. When I compile opencv, it’s being 100 percent and I got no error, but the command line doesn’t come to console,its not understood it compiled or not. I mean I can’t enter new command. How can I figure out? Can you still type via your keyboard or use your mouse? Is your Pi locked up? What directory are you when you try to create the sym-link? In “Run CMake for OpenCV 4” run those commands 1-at-a-time. THey do not work in one big copy/paste. I am trying to install openCV without a virtual environment and for python 2.7. This is due to some additional equipment that I’m using that requires installation outside of a virtual environment and is only compatible with python 2.7. I have previously installed openCV with python 2.7 following your tutorial, but this was done in a virtual environment. Now that I am trying both python 2.7 and no virtual environment, I am struggling to successfully install openCV. I am able to complete the build and install steps successfully, but when I try to import cv2 i get the error ‘ImportError: No module named cv2’. Is there anything different I must do to install openCV in this way? How do I go about successfully importing cv2? If you can skip the Python virtual environment, that’s not a problem. The same goes for the “Troubleshooting and Frequently Asked Questions (FAQ)” section of the guide, just be sure to check the “site-packages” directory of your system install of Python 2.7. Please keep in mind that the PyImageSearch blog is now officially Python 3+ so my Python 2.7 support moving forward will be fairly limited. Thanks for the tutorial. I was able to install OpenCV4 on my RaspPi 3. I tried -j4 which got mo to 100%…then it seemed to hand. I started over with -j1, left it for 2 hrs, and it finished. Make sure you refer to the “Troubleshooting and Frequently Asked Questions (FAQ)” section where I discuss most of the reasons why that may happen. Hello everyone …. Thanks to author for guiding in installation. It worked. However I am wondering if conda could be used, since I am kind of more comfortable with that. I have a question. I followed the instructions but when I start up the Raspberry Pi I cant enable the virtual env cv from command line. I always have to run the command source ~/.profiles and then I can do workon cv….. Is there a way to fix this? Did I do something wrong? You could use the conda environment if you wanted but it gets tricky to correctly supply the conda Python paths if you’ve never done it before. I only recommend doing it if you have good experience debugging Python paths. As far as your question goes, the source ~/.profile command only needs to be executed once per terminal session. That is normal. It sounds like you have not installed virtualenv and virtualenvwrapper properly OR you have not updated your .profile correctly. Double-check those steps. I have successfully installed opencv4. But now the problem is that I want to start my python script on raspberry pi on startup and it seems that I cannot enable virtual environment at startup. Please guide me how should I enable virtual environment and start my script. Please reply me with my email id. I am a complete noob… but have managed to install Opencv4 and Tensorflow in two different virtual machines. Thanks for a great tutorial on CV4 install. How ever I cant import tensorflow when working in the Opencv 4 environment, so I am trying to follow your tutorial but installing it outside a virtual environment. The cmake errors out and I am a noob so the error file makes no sense to me. 1 Could you please consider a short vid or tutorial to setup opencv 4 outside virtual environment. I would love to enter your “The PyImageSearch Gurus course” but I will get lost in the first lesson. 2 Have you ever considered a classroom setup where the enrolled people can ask Q? as you go? As far as the PyImageSearch Gurus course goes, I have designed the course to help you study computer vision even if you are totally new to computer vision. I also have provided pre-configured development environments you can use (no need to configure your system). You just download the virtual machine, install it with a few clicks, and you’re ready to go! I would suggest you give the course a try, I think it will really help you. This was the only tutorial that worked flawlessly to install and run CV 4. Thanks Adrian. Thanks Hanno! And congratulations on getting OpenCV 4 installed on your Pi! What runtime errors are you referring to? Thanks for the walk through. I have a question concerning doing this on a Raspberry Pi Zero W. I followed through all of your instructions and when it came time to try and import cv2 in the python environment, it threw an error. “FATAL ERROR: This OpenCV build doesn’t support current CPU/HW configuration”. Under that it says “Required baseline features: NEON – NOT AVAILABLE”. I did some research and found that the raspberry pi zero doesn’t support NEON? Can you confirm this? Also, what would be my steps to backtrack and fix this. Do I need to go back and run cmake with the neon flag turned off? What should I delete or do before I do this so I don’t have two sets of opencv libraries? Thanks for all of your help! thank you very much for everything! Just a short question: Can the folders opencv and opencv_contrib be deleted after successful installation? Or they still necessary for opencv to work? Once OpenCV has been successfully installed you can delete the “opencv” and “opencv_contrib” directories. Is this somehow related to the virtual environment from the older OpenCV? Each time I enter workon cv I need to enter source ~/.profile, or I get a bash error. 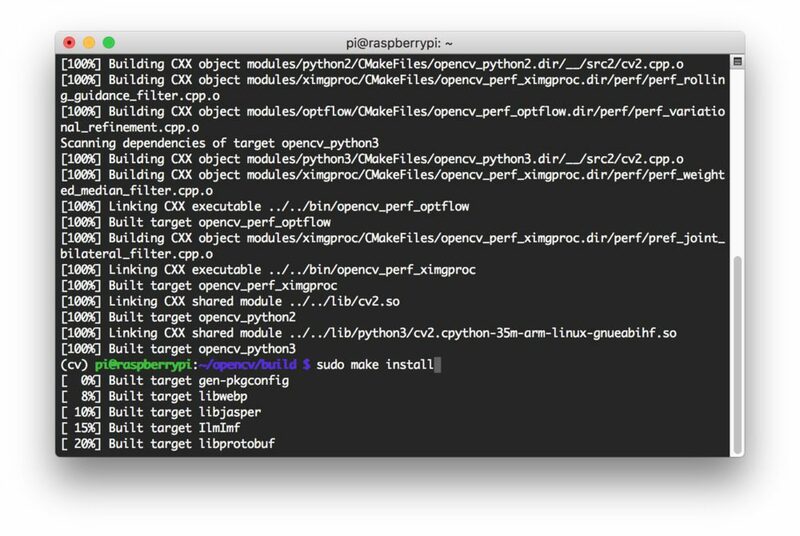 Did you create a new Python virtual environment for your OpenCV 4 install? If so, you definitely need to. Hi, thanks for the quick response, I did the virtual environment as per step 4 above. I’ve been over the tutorial on virtual environments, but can I redo step 4 without re-installing OpenCV 4? Yes, you can do it over, just make sure your sym-link is correct. I get the impression that you may have installed a previous version of OpenCV on your Pi before you followed this tutorial though. Thanks, that did it. I just repeated steps 4 and 7, and named the new virtual environment cv4. Yes, I have opencv 3.4.1, 3.4.2, and now 4 installed. Awesome, I’m glad that worked! I would just like to say that this is one of the most useful and comprehensive ‘How-to’ articles I have ever followed. Not only did each step work, but each step both taught me and explained things along the way. A brilliant, well thought out practical article. I don’t know which IDE you are using, but if it’s anything like PyCharm you likely need to set the Python project interpreter to point to the Python virtual environment. See this tutorial on instructions to do exactly that. That’s not how you access SIFT in OpenCV 3 and OpenCV 4. See this tutorial. I’m having trouble with step #5. Everything seems to compile just fine in my virtual environment, but when I check the output, I can’t find anything indicating that the compiler is pointing to python 3 and numpy. Any suggestions? Make sure you use the “workon” command to access your Python virtual environment first. It sounds like you may have missed that step. I ran out of swap while building and the Pi 3b hung. I discovered a way to temporarily increase the swap file on the fly (no reboot) which allowed me to save the build. I’ll be using this in the future rather than changing the default swap space with /etc/dphys-swapfile in the future. Excuse me, there will be some way to optimize opencv and install without graphics, I am currently using it for object recognition with audio output and I do not require graphics. thanks greetings. Are you referring to a headless install of your Pi and OpenCV? Hi Adrian – I just wanted to install it without the virtual environment as this machine is just going to run scripts not really develop them. 2. In a couple of your replies above, you briefly mention that you use symlinks to make opencv available in multiple virtual environments with the same python version without reinstalling a new copy of opencv on each one. Any chance you could give more detailed instructions on how to do this? I’d really like to know how to make environments share site packages of my choosing to save space and am struggling to find instructions online. 1. Whether you use virtualenv or venv is a matter of preference. Have you tried using either? What has your personal preference been? 2. If you’re having trouble understanding sym-links I would suggest reading the “man ln” documentation first. Here is another simple tutorial you can refer to. Try creating your own sym-links to files on your desktop, in your documents directory, etc. I get the impression that you may be new to Unix systems — that’s totally okay but make sure you walk before you run first. Grasp making basic sym-links first before you start trying to share files across multiple site-packages directories. If I compile with a single core it is certain that it will complete the compilation? Yes, try compiling with a single core — that should resolve the issue. Do i hv to delete the build folder, or i just continue with the make command ? Hi Adrian, after successfully completing step 7 and the sanity check for the version number (it all worked till that point), I tried to follow your tutorial “Accessing RPi wth OpenCV” on the capture of single image test_image.py. I was getting the import cv2 error. I am using a Win 10 laptop and doing SSH into a headless Pi 3 Model B loaded with Stretch Lite, Pixel Desktop and Thonny Python IDE . This is what I did to partially solve the problem. and then I was able to run your tutorials on capturing a single image and also accessing the webcam videostream. I mentioned the problem is solved partially only because I can only run the python programs in the Pixel GUI desktop environment , not the SSH command line. I had already followed the instructions left by another forum reader to install Xming server on windows and also the ssh -X command and also enabled the X11forwarding in the X11 config file. But I still get error messages when trying to run the python files in SSH command line. Secondly, the partial solution I used seems to suggestion the interpreter path in Thonny was not pointing to the ./virtualenv… path of the interpreter. How can I solve this problem if I wish to follow your steps in working with a virtual environment ? Apologies for the long mail, I am seeking help as this is meant for a school project. You mentioned you are using a headless Pi and that you installed X11 on your Windows system. Did you install X11 on your Pi though? You’ll need X11 installed on the Pi as well. As far as Thonny goes I don’t use that IDE and I’m not familiar with it. If it’s like other Python IDEs you can set the Python project interpreter to point to your virtual environment. You may need to do your own research there. Hi Adrian, how do I go about installing X11 on the Pi? Secondly, is there any Python IDE that you can recommend where it is easy to use and install on the Pi in the SSH command line environment? I had to resort to using Thonny based on what I could google. So far, my difficulty with Thonny is I can’t seem to amend the path of the interpreter. That seems to be what is driving the “missing cv2 ” error messages when running the python code. I started out with the Stretch Lite and installed the Pixel desktop with very bare software hence there was no IDLE software in it and I am trying to avoid reinstalling the Stretch Desktop image if possible. 1. I would suggest you do some research on how to install X11 on the Pi. There are a number of different packages that you may need to install and I cannot answer that directly for you. Take the time do some research on how to install X11 on the Pi. 2. I would suggest using Sublime Text 2 on the Pi. Sublime Text is a nice editor. You may also want to look into using PyCharm from your laptop/desktop and have the files automatically upload to the Pi. Thanks a lot for the detailed procedure. I got the CV installed finally by making use of the make command without passing the j flag. Congrats on getting OpenCV installed on your Pi! Have you increased your swap size as well? Hello everyone, i tried to install opencv4 2 times but again it blocks in 100%, i can still move the mouse or write something with the keyboard. I don’t know what to do, i increased my swap and, tried first time with make -j4 , and second time with only make, but still doesnt work. i have an rpi 3 B+ and a sd card 16go . can anyone explain that to me please ? What is the exact error you are getting? Without knowing the error I cannot diagnose or provide any suggestions. Will this tutorial simply not work on a Raspberry Pi 2 Model B, or will it just take a long time? It will take a long time but provided you have Raspbian installed, yes, it should work. I have succesfully installed open cv 4 in my rasp pi 3 via putty. But the problem is that i cannot acces the program when i connect my pi directly to my monitor. It sounds like you may be forgetting to use the “workon” command to access your Python virtual environment before executing the script. The compilation always seems to be stuck at “Scanning dependencies of target opencv_python 2” and then produces an error even if I increase the swap and use “make -j1”. That’s definitely strange behavior. What is your exact error? I was successfully able to install OpenCV4 but when I try to import cv2 …”I got import module: no such module name “cv2”. 3) There is cv2 directory in /usr/local/python . 4) I tried the last step indicated in the FAQ section for this question. Still, cv2 can’t be imported please help me. Are you in your Python virtual environment via the “workon” command before trying to import the “cv2” bindings? Can you import OpenCV outside of your Python virtual environment? It sounds like at some point your Python versions got mixed up or your sym-link was placed in the incorrect location. Unfortunately, without access to your Pi it’s extremely hard to diagnose. I would suggest you try again with a fresh install of Raspbian. You can use your favorite text editor to edit the JSON file. That could be your terminal (vim, emacs, nano) or a text editor. Open up the JSON file and then change the setting. Thank you very much for the great instructions! I installed OpenCV 4.0.1 but didn’t do dist upgrade before – worked like a charm with only a few tweaks. Fantastic, congrats on getting OpenCV 4 installed on your Raspberry Pi! i cant install opencv and opencv contrib. please help. it says “wget” not recognised ….im using windows 10. This tutorial is for installing OpenCV 4 on a Raspberry Pi, not Windows 10. Make sure you are executing the commands on the Pi. While compiling open cv, some of the dependencies reached 100% at last , but when i go up, some didnt reach 100%….is it normal? Was OpenCV able to successfully compile? Or did your Pi freeze up and get “stuck”? Thanks Adrian for the tutorial. and it worked like a charm for me. Fantastic, congrats on getting OpenCV installed on your Pi! dear Adrian, i already install the Opencv as your instruction, and is working after installed, moreover at the moment i restart my raspberry pi, and write “import cv” is gives error no such command. could you please tell me what is wrong ? The name of the OpenCV bindings is actually “cv2”, not “cv”. It also sounds like you didn’t launch a Python shell before trying to import. Compiling OpenCV on a Raspberry Pi Zero is a royal pain. I don’t recommend it. The Pi Zero is extremely underpowered and isn’t a good solution for computer vision. I would honestly try to use a Pi 3 if at all possible, the performance gains will be significant and it will be far easier to install. Hi Adrian, thanks for this great tutorial. But I have one problem. I have done all steps but if I try to import cv2 I will get an error. If I check my installed modules using “pip freeze” it shows me only numpy. There is an cv2.so file in the site-packages directory of my virtualenv but no cv2 directory. The virtualenv works fine and I got the (cv) prompt after the workon cv command. What went wrong? Thanks for your help and your great work! Unless you installed OpenCV via “pip” you will not see OpenCV listed in the output of “pip freeze”. Double-check that your sym-link is a valid one, it’s likely that the sym-link is pointing to a file that doesn’t exist. I am having a similar issue as the original post. I had few questions regarding the symbolic link as well. I understand where the file that is first stated in the line “/usr/local/python/cv2/python-3.5/cv2.cpython-35m-arm-linux-gnueabihf.so” is located but what is the file location of the “cv2.so” that the symbolic link is being created with? Is that the cv2.so file that is located in the virtual environment? Adrian sir, can i use the raspberry pi with this opencv4 and python3 virtual installation for practical projects and how can i access this isolated environment please give detailed information. Yes, you can use this method with multiple OpenCV versions installed. Just create a new Python virtual environment for each OpenCV version you want installed. Compile and then sym-link in your bindings to the “site-packages” directory of the Python virtual environment. Python IDLE does not respect Python virtual environments. I would suggest you use Jupyter Notebooks instead. I found a raspberry with OpenCV 4.0.0 alpha that i should have installed last year. 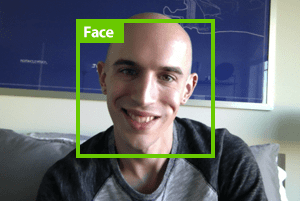 And now i want to build the face recognition that you made. Do you sugest me to continue with this “alpha version”?? or should i update it to the latest. If i have to update it, should a update/upgrade command be enough? or i have to installed from the beginning. You won’t be able to update/upgrade, you need to download the source code of OpenCV 4 that you would like to utilize then compile it. Compiling and installing OpenCV on a Pi Zero W can be a huge pain — my only suggestion here would be to increase your swap size again. The compile will take longer but shouldn’t freeze. I had an error too in the j4 command. my raspberry freezed and i closed the command window. Then when I restarted raspberry It worked too slowly. Why is that? any suggestions? After some errors I finally install open cv. Thanks to you! Meanwhile, pi is slower than before opencv installation. Is there any thing to do for this? Congrats on getting OpenCV installed on your Pi, nice job! Is it possible to install opencv_contrib after installing opencv? I am running rasbian stretch on 8GB sd card and need to preserve memory as much as possible, so I was thinking of installing opencv first then delete contents of build and then building opencv_contrib. Can you help? No, you will need to re-compile and re-install OpenCV, unfortunately. I want to install Open CV 4.0 without a virtual environment in raspberry-pi. may I know what setups to flow?. Thanks you so much. I successfully installed OpenCV4. Congrats on getting OpenCV 4 installed on your Pi! Nice job. Hi Adrian I followed your steps exactly the way they are but when i run the make -j4 command the raspberry pi freezes and I know you said to just type in make if it does that but it also freezes when i type in make by itself. it gets to a 100% and freezes and I can’t get past that. Any way of fixing the issue? Try using “make -j1” instead to compile with just a single core. thanks so much for your installation instuctions. I did both the Mac and the Raspi installation and they worked right away, so I could run the 2 sample projects. From other experiences I made, I can estimate and value the amount of time you saved me. Looking forward to learning how to implement my own project. Congrats on getting OpenCV 4 installed on your Pi, nice job! Hi Adrian, what a great tutorial. Like others, I am hung on the make step at about 92% compete. The machine is totally unresponsive. I’m going to try increasing the swap file size to 2048 like others have done. My question is: do I need to do anything special to clean up after the failed make before trying it again? You can try to restart the compile but this time use just “make -j1” to compile with only a single core. If I will install OpenCV according to your tutorial will I be able to write code in C++ with openCV libraries and then compile it or I have to use python? You will be able to use both C++ and Python. Hi Adrian, im following your tutorial, but when I run the CMake, the “OPENCV_ENABLE_NONFREE=ON” flag doesnt seem to work, as it does not enable the non free aspects (wich I really need for my current project).